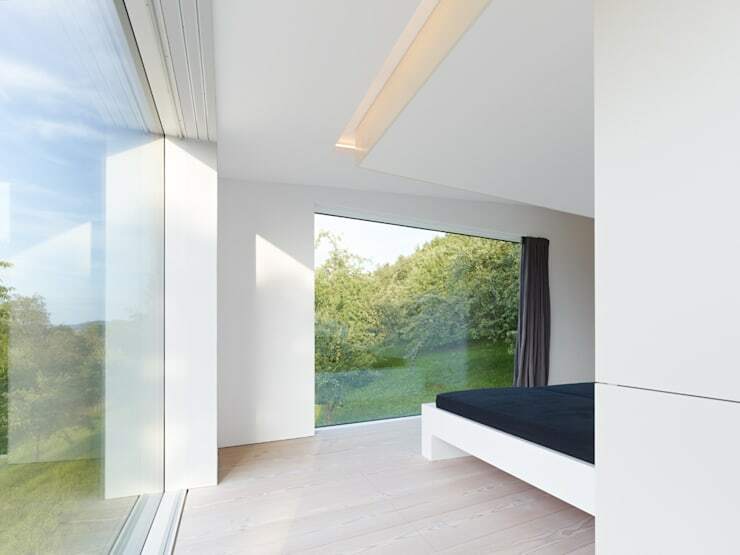 Today on homify 360 we admire in amazement, the elegance and charm of a perfectly minimalist and modern home. 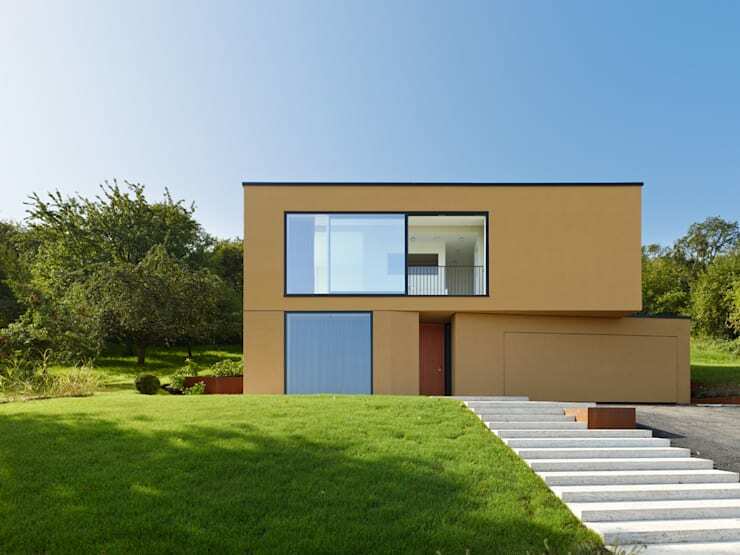 This wonderful house has been built in Germany, by the expert team at Archifaktur and is a pleasing sight surrounded by grassy greenery and forest. The home is defined by simple lines and its cube shape, which make the exterior attractive. But wait until you see the interior… it's filled with light and bright, magical yet surprising modern innovative design. Are you curious? Well then, let's see what makes this home so exceptionally special? The sandy colour of this beautiful cube home is a surprising take on the minimalist idea, making the house warm and welcoming. The neutral tone was used instead of the usual monochromatic colour palette often seen in modern minimalist homes. The classic black window frames adds a contemporary edge to the façade, making it stylish and attractive, while the vibrant green lawn creates a picturesque setting, complementing the colour tone used on the exterior. Understated simplicity! This all-white interior decor includes everything from the roof to the floor, creating an almost futuristic atmosphere that displays perfect minimalist ideas. The combination of kitchen and dining room is spacious, but not in a cold and stark way… in fact, the room is rather welcoming. The fantastic addition of the fireplace hidden within the wall, is sure to warm up the kitchen and dining room during winter, while it also warms the living room on the adjacent side! Now that is smart! The shared kitchen and dining room is sleek and chic. The well-lit modern kitchen houses the storage area for groceries, crockery and cutlery as well as appliances, all perfectly and discreetly integrated into the white wall. The stove and sink are both located and almost camouflaged within the minimalist centre island, which is modern and elegant. The dining table maintains a natural element, with its wooden design and comfortable chocolate coloured chairs, completing this appealing decor and achieving a minimalist appeal. While the soft hanging lights above the dining room table, will definitely add an intimate ambiance to the room. 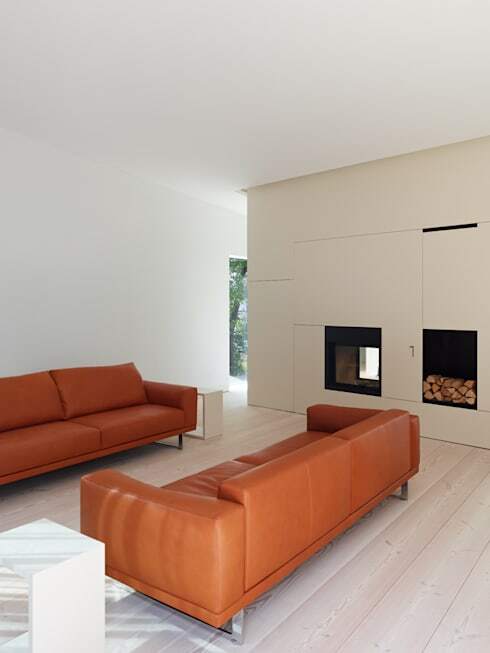 While this living space maintains the minimalist look in terms of its all-white interior walls, the warmth and comfort of a designer space is not neglected, this is evident in the comfortable caramel-coloured sofas that add a much needed pop of colour to the decor. This living room shoes us the other side of the hidden fireplace, making this room welcoming and relaxing on a bitter and cold winter's day. The first thing that comes to mind when seeing this comfortable and timeless bedroom is the natural sunlight streaming in through the large windows, allowing for a panoramic view of the stunning forest, where peace and serenity can be enjoyed from this treetop angle. Minimalism is a key factor in this bedroom, with all-white walls, dark grey curtains and simple navy bed linen creating some contrast in colour. But, with this amazing view of the forest, it is no surprise that the simplicity of the decor along with the breath taking views of nature, makes this bedroom a timeless choice. A bathroom that seems like it is outside? Well, that's different. The large sliding doors allow for a comfortable breeze, while soaking up the suds in the modern bath tub, creating an atmosphere of being one with nature. 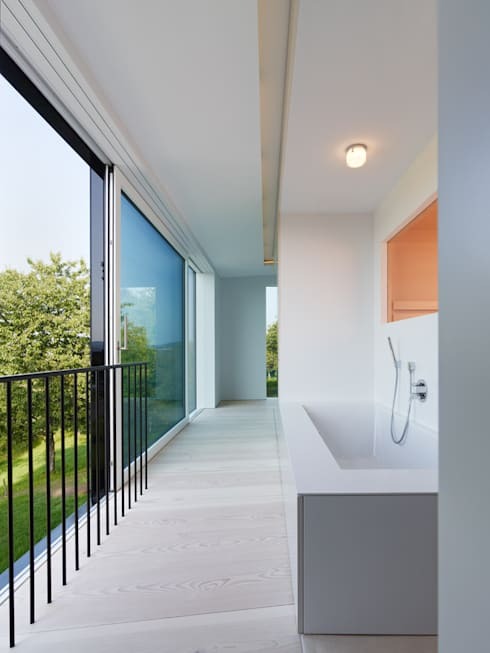 Although a balcony in the bathroom might pose the question… what about privacy? Privacy is not a problem here, this home has been built in a sparsely populated area, making the surroundings free of neighbours and prying eyes. If this cube home inspires you, then how about some more ideas from homify? Totally Unique Cube Homes! Modern and minimalist home design? Yes or no? Is it cold and unwelcoming, or just right? Share your thoughts with us!